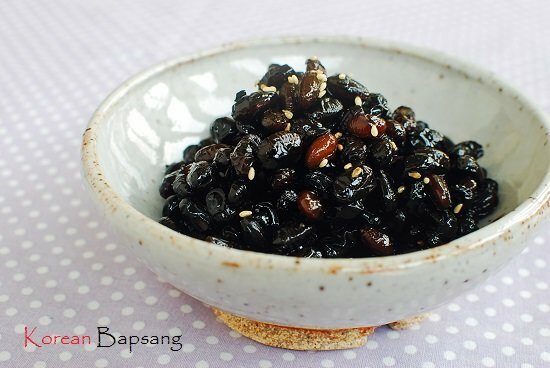 Kongjang (콩장), also called kongjaban (콩자반), is a sweet and savory soybean side dish. 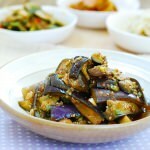 On weekends, I try to make a few side dishes, banchan (반찬), to help make my weeknight meal preparations easier. During the week, I make a quick soup, stew, or meat dish and serve it with the pre-made side dishes. 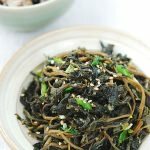 We call those side dishes that are made to last long and served with every meal over several days (or weeks) mitbanchan (밑반찬), meaning basic side dishes. There are a number of them, ranging from stir-fried dried anchovies to pickled perilla leaves. 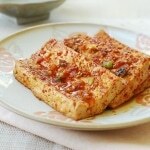 We grew up on these mitbanchan dishes. They were a big part of every meal, including home-packed school lunch boxes. Kongjang is one of the most common ones. It’s typically made with black soybeans, but you can also make it with yellow soybeans. The soaked beans should be cooked in water first before you add the sugar and soy sauce for slow braising. This will keep the beans from getting too hard. Cooking in an open pot helps reduce the liquid and gives the kongjang beans their unique shiny and wrinkled look. The result is sweet and savory beans that are a tad chewy, which is a nice contrast to steamed rice they accompany! Rinse and soak the dried beans for 3 – 4 hours. (The time required may vary depending on the beans.) Drain. In an uncovered medium size pot, bring the beans and 2 cups of water to a boil. Continue to cook, uncovered, over medium high heat for about 5 minutes. Stir a couple of times so the beans don’t stick to the bottom of the pot. Skim off the scum. Add the corn syrup, stirring well to coat, right before turning the heat off. 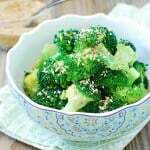 Sprinkle with the sesame seeds. The beans will be soft at first, but they will get a bit chewier in the fridge. Is rice wine the same as Mirin or are you referring to Soju? I mean cooking rice wine, but you can also use mirin. Added it to the recipe. Thanks! 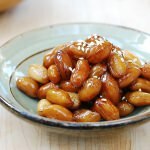 Can brown rice syrup or honey be used in place corn syrup? Will it give the sweetness and sheen? Yes, you can use either one. It will be good. Thanks! 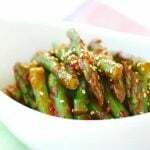 This is one of my favourite side dishes! Haven’t had it for ages.. (like a decade) 🙂 Thanks for reminding me. Yeah, I don’t think I’ve had this in about a decade either. My mom used to always have some of this and some other banchans in her fridge. I’ll have to try this and see if my kids will like it. 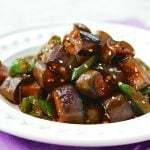 Eversince I encounter this recipe of yours, this dish is frequently in my fridge! Thanks. Great! Thanks!! Yellow ones are fine as well. Enjoy! I love the kong jang but always bought it from the Korean chain store in Atlanta because I live about 120 miles away. I will try to make it by myself this weekend. Wish me a luck! You can do it! It will be good. Thanks for coming by! 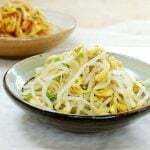 Seoritae bean is linked to a study in Korea which reduces enlarged prostate. Can you please tell me where to find in USA. 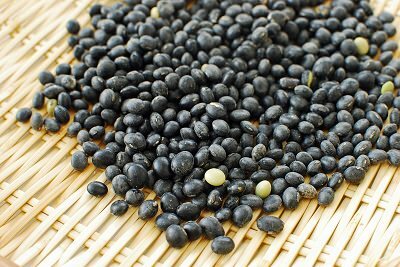 You can find black soybeans at any Korean market in the U.S.
I’m an American married to a Korean that recently relocated to Hong Kong. Funny, when we lived in Seoul we didn’t cook Korean as often but now we can’t get enough of it. Every dish I’ve made from your site has met with smiles from my husband, declarations that it’s perfect and requests to make it again and again. Black beans are happily on the menu for tonight, a frequently repeated dish. Just wanted to pop in and say thanks! You’ve made us a little bit less homesick. Hi Deborah! I’m so happy to hear that! And thank you so much for taking the time to write me a note! Hope you and your husband fully enjoy Hong Kong and all the Korean foods you make there. We bought some braised black bean from Gwangjang Market. It was all black & skin were all intact. However I followed your recipe to braise them the black bean skins were all loose & off the beans. Would like to know why it is so? What’s the cause of it. Thanks. hmm how long did you soak the beans? That can happen if the beans were soaked too long. You can tell from the photos mine were all black with skin all intact too.